Lithophane’s are some of the most popular things made with the CarveWright System, and one of the easiest to make too!. Use these tutorial resources to learn how to make these amazing carvings. 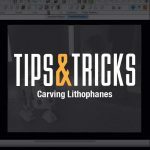 When you are ready to make your own Lithophanes, purchase the material from the CarveWright online store. In Chapter 2, page 128 of the Learning Guide Lithophanes are covered very thoroughly, if you want a nice guide to print out. The CarveWright Rotary Jig can be used to create unique lithophanes using common PVC plumbing pipe. The results are impressive! Now you can create unique lithophanes that most people have never seen before. This was also covered in a Build Blog article here. Carve Time: How long will it take to carve?